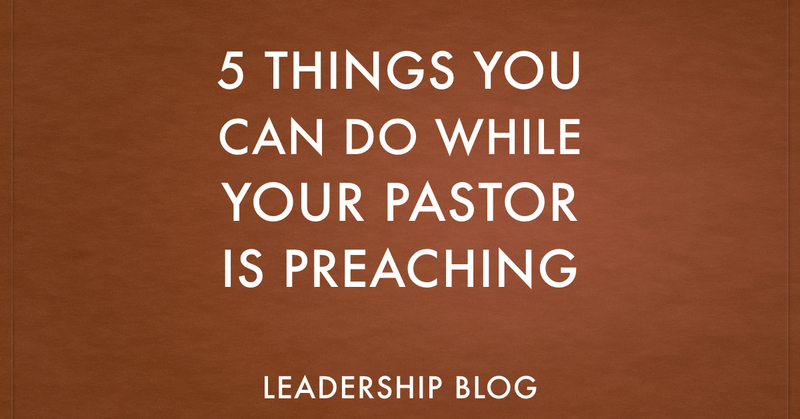 What do you do when your pastor preaches? Do you zone out? Do you play with your phone (text, Facebook, etc.)? Do your try and listen? Listening to a sermon does not have to be a completely passive experience. Here are five things that you could be doing. 1. Take notes. One of the most encouraging things for me as a preacher is seeing people take notes. Preachers put a lot of work into sermons and you likely learn something new. Write it down before you forget. While some people use notebooks, I suggest writing in your Bible. Here is my recommendation. 2. Pray. While your pastor is preaching, take some time to pray for them. If your pastor is talking about a certain group of people, pray for them. Pray for the people in the congregation who are listening to the sermon. 3. Make a mental note. Listen for something in the sermon that really connects with you and make sure to mention it to the pastor after the service. It is tremendously encouraging for the pastor. 4. Check your Bible. Have your Bible with you and check the references that the preacher makes. Is what the pastor is saying biblically accurate? I am not suggesting you turn into a super-critic, but as a preacher, I often encourage the congregation to not take my word for it but to check themselves. 5. Respond to the Word. What are you going to do with the sermon that was preached? Was it just a history lesson or Bible trivia for you? Find one thing in the sermon that you are going to act on that week. Make the sermon that you heard something practical in your life. Bonus Item: Consider live tweeting some of the points in the sermon. Others may find what you hear helpful. Make sure to let the preacher know before hand so they don’t think you are playing a game. Also, make sure to give credit to your pastor for what they say. These are just five things that you could be doing during the sermon. It sure beats checking your watch.